DownWithTyranny! : Why does The Donald lie? "In returning to this sort of language now that he’s got the nomination—and escalating it with his use of the phrase 'founder of ISIS'—Trump is, on the face of it, harming his prospects for November. . . . He sounds like he is talking to his angry base, and supplying them with an inflammatory narrative that can be trotted out for years, and decades, to come." Trump's Crazy Talk About Obama and ISIS Matters"
If this rings a bell, perhaps it's from the similarly loony rewrite of history done by The Donald's hand-picked running mate, The Unspeakable Pence, who managed -- in distancing himself from the still more extreme position of the man who has chosen him to be a heartbeat away from his presidency -- to "explain" that Capt. Hamayun Khan's killing in Iraq in 2004 was the fault of the devil Obama and the chaos he created in Iraq, even though at the time of Captain Khan's death Chimpy the Prez not only was still president but would still serve another full term. And the problem for the country is that this may seem quite believable to the people who are prepared to vote for The Donald. Which is not only terrifying but ironic, because clumsily buried beneath the Trump and Co. lies about Iraq is a truth that the country has never been prepared to face: that indeed all sorts of humongous international problems were created, or at least exacerbated, by American actions in Iraq (and also Afghanistan) -- except not the devil Obama's, but none other than Chimpy the Prez and the invasion that was "justified" by an entire fabric(ation) of out-and-out lies. (1) The country as a whole swallowed Chimpy and the Neocons' lies pretty much whole. It's not as if absolutely nobody was in possession or at least in search of the truth about Iraq (and Afghanistan). Enough of it was already gleaned that it should have made a difference if the country had given a damn about the truth. And, as we've noted frequently, even in the aftermath of the disaster of our involvement in Iraq, the people who had advocated for the truth were almost uniformly punished, while the people who had formulated or at least propagandized for the lies were almost uniformly rewarded. (2) Similarly, the country ignored the real-world effects of our military involvement in Iraq and Afghanistan. Again, there were observers pointing out that our actions in Iraq and Afghanistan, far from combatting terrorism, were laying the groundwork for a whole new generation of terrorists, for wider-spread and more destructive terrorism. But the country as a whole made it clear that it didn't want to hear anything about that. Only to be easy pickings for the Trump and Co. rewrite of history. Does this make any sense? As a matter of fact, it does. Because at some point in the above-alluded-to second term of Chimpy the Prez, that same broad middleground of America, people who had once treated Chimpy as divinity, and denounced even the mildest criticism as "Bush-bashing," lost its devotion to the lies of Chimpy and Co. Partly it was the inescapability of the messes in Iraq and Afghanistan, and the contrast of the reality with the bright and cheery lies Chimpy had fed them and they had swallowed so eagerly. Partly it was the visible ineptitude of the Bush administration's response to Hurricane Katrina. Partly it was assorted other first-term Chimpy-chickens coming home to roost. And eventually there was economic catastrophe presided over by Chimpy and his team. This idea of creating your own reality and pretending it's actual reality is fun as far as it goes, but sometimes the real thing has a way of getting in the way. Interestingly, though, when the former Chimpyites turned on their onetime idol, it didn't take the form of them blaming him for what he'd done. He simply disappeared from their consciousness. By the time of the 2008 presidential campaign, it was as if he had never existed, even though he was still the president of these United States. Barack Obama, by contrast, gets blamed for everything that Chimpy never did get blamed for. As I argued at the time, it wasn't that the Chimpyites were prepared to come to grips with reality. No, it was more like they had become passionately disillusioned with the years' worth of lies Chimpy and his people had told them but they were demanding, often angrily, newer and better lies. And now they're getting 'em. And, I worry, swallowing 'em. This scares me for two reasons. First, I'm still not persuaded that The Donald can't win. If people are sufficiently determined to reject reality in favor of a more "acceptable" concocted version, they can do it. And the degree of Hillary hatred makes this possibility substantially less impossible. 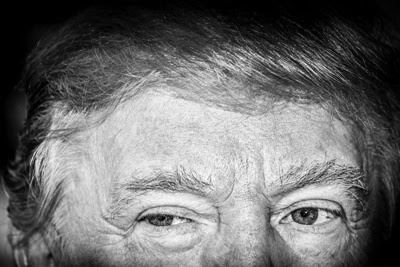 But second, even assuming the Trump candidacy crashes and burns, the broad national disaffection he's tapped into, and the descent into delusion he's proposed as a response, will remain fixtures of the political landscape going forward. At this stage, some will argue that it isn’t worth the effort to interpret Trump’s misstatements, or to point out the truth of the matter—in this case, that a Jordanian named Abu Musab al-Zarqawi founded ISIS, in 2004. At the very least, it should be obvious to everyone by now that Trump doesn’t deal in reality; he deals in mythmaking, demagoguery, and carnival barking. When he’s not tied to a teleprompter, Trump often seems to say the most provocative thing that comes into his head, with little thought for the consequences for his campaign, or for the campaigns of other Republicans. He’s like a small child, trying to be the center of attention, even if that means he has turned himself into an object of outrage and ridicule. If you take this view of Trump, there isn’t much more to be said. 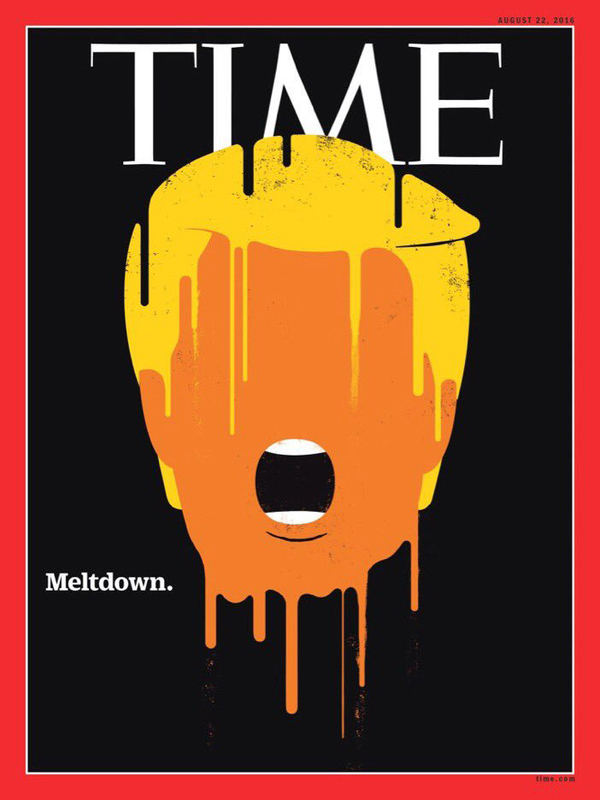 He’s the melting figure on the cover of this week’s Time magazine [see image above -- Ed. ]: a reality-television shyster who somehow captured the nomination of a major political party and is now dissolving in front of us. The only remaining questions for you are how big a majority Clinton will rack up, and whether the Republicans can limit the damage in the Senate and the House of Representatives. "I’ve got a lot of sympathy for this interpretation.," John writes. "But, just for the sake of argument, let’s assume that Trump is smarter and less myopic than he seems." Let’s assume that what he’s really focussed on isn’t winning this year’s election, a task he now realizes is beyond him, but creating a long-term Trumpian movement. A nationalistic, nativist, protectionist, and authoritarian movement that will forever be associated with him, but which also has the capacity to survive beyond him. And he cites the current reactionary movements in France, Austria, and the U.K., not to mention the similar movements in our own history. History tells us that for right-wing populist movements to succeed, a number of things need to be in place. For one thing, they need a narrative that mainstream political leaders, and political parties, are guilty of not merely incompetence but betrayal. In returning to this sort of language now that he’s got the nomination—and escalating it with his use of the phrase “founder of ISIS”—Trump is, on the face of it, harming his prospects for November. He certainly doesn’t sound like he’s trying to win over the soccer moms in Columbus, or the office workers in Tampa, that he needs to win the election. He sounds like he is talking to his angry base, and supplying them with an inflammatory narrative that can be trotted out for years, and decades, to come. It’s a tactic that politicians outside the United States, such as Jean-Marie Le Pen and Jörg Haider, have used to good effect in building up far-right nationalist movements. John goes on to make quite a nice case about the potential effectiveness -- in the context of building a longer-term movement, of The Donald's blithering about the election being stolen -- a scenario to which a lot of Americans are apparently susceptible, as long as it doesn't include that actual attempts at election-fixing by the soldiers of the Right, with some interesting backup from other scribes. You may be relieved to learn, as I was, that John doesn't really believe The Donald is masterminding "an enduring America First movement that will eventually supplant the Republican Party." But that doesn't mean the country will pick up as if nothing happened in the event that The Donald simply leaves the mess behind him and "go[es] back to [his] very good way of life." Four years from now, or eight years from now, a more disciplined and self-controlled figure could take up where he left off. If at that time the United States were facing a serious economic or national-security crisis, more Americans—conceivably even a majority of them—might be willing to accept the argument that regular politicians have failed and betrayed them, and that drastic measures are called for. Healthy democracies don’t decay overnight. They gradually rot from within, with termites like Trump undermining their foundations. Which is kind of what I've been trying to say, John, only you've said it much better. Labels: 2016 presidential race, Andy Borowitz, Barack Obama, France, Germany, John Cassidy, New Yorker (The), right-wing movements, Trump, U.K.
Great piece, Ken. I'm becoming increasingly exasperated by so many Dems' nitpicking of Hillary's many faults. While there are many of high concern and Bernie supporters sure know them in depth (e.g., her hawkishness and corporate/bank ties), in reality she is now all we have standing against Trump. So please, let's make sure he does not get into the Oval Office. I used to spend endless hours arguing with my friend about why I dislike Hillary and love Bernie, and she kept saying not to bother - she will get the nomination and we'll have to vote for her in spite of it all to stop Trump, the madman. And boy was she right.